Despite their best attempts, race officials were forced to abandon racing on day 4 of the McDougall + McConaghy 2015 International Moth World Championship being hosted by the Sorrento Sailing Couta Boat Club (SSCBC) at Sorrento in Victoria. At a meeting with Moth competitors this morning, Event Director, Peter Osbourne (from the SSCBC) asked for a show of hands for racing. Most in the Gold fleet elected for racing. All but a couple in the Silver fleet voted against. Officials asked competitors to stay ashore while they waited for visibility to improve, along with the general conditions, including pouring rain and winds that were up and down like a yoyo. Finally, late this afternoon, the Gold fleet headed out to the course, but PRO Garry Hosie felt that of the fleet, perhaps only ten would finish, so once again, racing was abandoned. 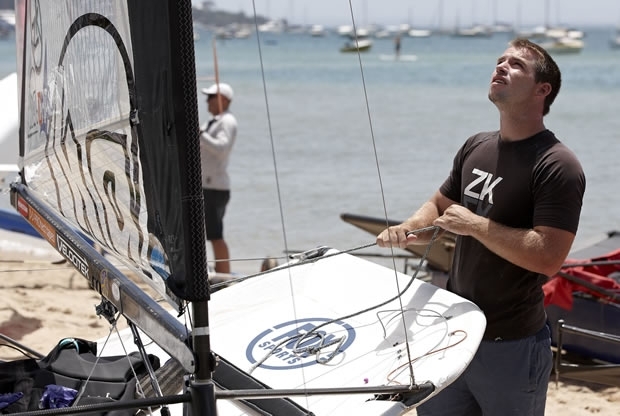 Some competitors felt they could race, Josh McKnight (AUS) and Tom Slingsby (AUS) amongst them. But others thought it was a good move, because a fair amount of damage could occur in the built up seaway. Scott Babbage, is in third place overall, three points behind McKnight. He said, “I’m going very fast at the moment, but if you were going to pick anyone to win, you’d have to say Peter Burling, without a doubt. “I was quick on the second day (good solid wind), some more of that would be good,” he added. Early this evening, Peter Osbourne commented: “The weather has been challenging and we’re wondering what we did in a previous life to deserve it! Osbourne assured all that, “We are here for the customer, the sailors. We’re going to have a technical advisor, Andrew Baglan, on the Gold course on Thursday to represent the class. He is a Moth Sailor and an international umpire. Scott Babbage suggested him,” he said. “We are going to try our very best – the enemy has been not only high or not enough wind, but the tides too. We have mucked the troops around enough, so we’re going to try to have six more races. Tomorrow, though, we’re going ahead with the lay day, because winds in the high 20’s are expected. We will start again from 11am on Thursday. We want to deliver what the class wants,” he said of the McDougall + McConaghy 2015 International Moth World Championship.